Wealthier people in America do not follow the conventional asset allocation model of buying bonds, i.e. age equals your bond percentage allocation or a 60/40 equities/fixed income split. How do I know this? Personal Capital has over 800,000 users of their free financial dashboard to help manage your money and I’m a consultant who is privy to some of their data to share with all of you. Data geeks, rejoice! Out of 800,000+ Personal Capital financial dashboard users, roughly 165,000 of them have linked investable assets of between $100,000 to $2 million. We call this the mass affluent class, or upper middle class if you’re so inclined. The mass affluent are generally regular folks with mainly W2 income. They save and invest in order to provide for their family, pay for expensive tuition bills, take a couple nice vacations a year, and hopefully achieve a comfortable retirement when all is said and done. Let’s do a quick review of my proposed stocks and bonds asset allocation model before moving on to the big data. 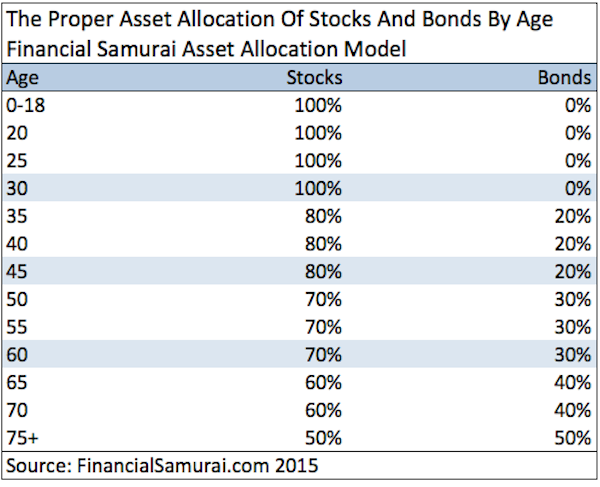 The Financial Samurai Asset Allocation Model shuns bonds until age 35, and begins with a 20% bond allocation until reaching a 50/50 split by age 75. * You have multiple income streams. * You are a personal finance enthusiast who gets a kick out of reading finance literature and managing your money. * You are not dependent on your 401k or IRA in retirement, but would like it to be there as a nice bonus. * You are not dependent on Social Security. * You are an early retiree or one who is shooting to be an early retiree who won’t be contributing as much to your pre-tax portfolios as before. * You have average genetics and plan to live between the ages of 80-90. In other words, my model is relatively aggressive. 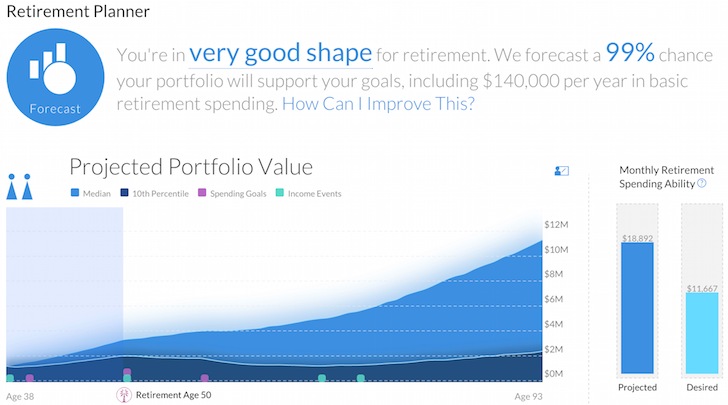 What’s interesting is that according to the data analysis of the ~165,000 mass affluent users of Personal Capital’s financial dashboard (most of whom are not paying clients, but free dashboard users), their bond allocation is also very minimal, much like the Financial Samurai Asset Allocation Model! Let’s explore the data in a little more detail. Study these six charts from Personal Capital’s demographics carefully. The easiest way to analyze the charts is to compare the age range with the bond allocation in red. The higher the difference, the higher the investment risk compared to conventional wisdom. At the end of the asset allocation charts, I’ll share with you five key takeaways. What an aggressive portfolio for those who are no longer working! 1) Young people aren’t taking the most risk, older people are. Not even in my most aggressive “Nothing To Lose Asset Allocation Model” or “FS Asset Allocation Model,” where there’s lots of alternative income streams, would I ever recommend a 65+ year old to only have 18-19% of their investment portfolio in bonds. 65+ year olds are likely no longer interested in working 40+ hours a week. I certainly don’t know any 75-89 year olds who are working steady day jobs. A 20% or less bond + cash allocation for people under 44 seems more digestible, since people under 44 have at least 20 years to make up for any massive losses. 3) Even in a downturn, things aren’t so bad. Let’s say there is a 50% correction in the stock market for a 75-89 year old who displays the exact same asset allocation profile above with a 62% allocation in stocks. With bonds and cash equaling 32%, his/her entire portfolio will probably only be down by ~30%. Now let’s say that the average net worth for 75-89 year olds is $800,000 based on dashboard data; the 75-89 year old still has $560,000 left over after a 30% decline. Surely $560,000 is enough to last a 75-89 year old for the rest of his or her life since the median life expectancy is roughly 81-84. The chances of another financial crisis like 2008-2010 in our lifetimes is small. 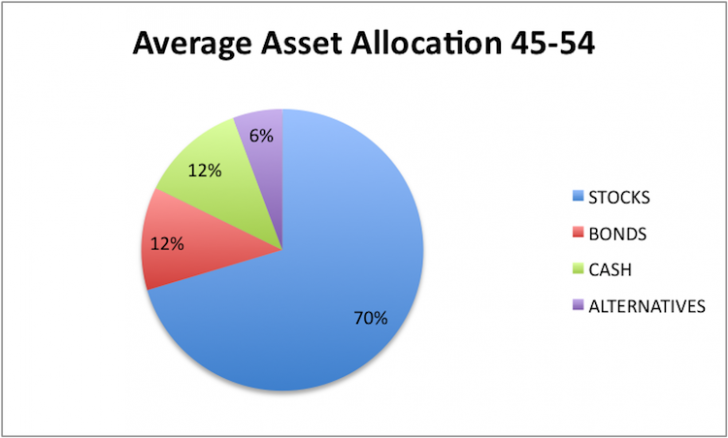 4) Alternative investing is a decent percentage of every asset allocation. For every age range, alternative investing comprises 5-7% of an investor’s total allocation. That’s a pretty decent allocation given private wealth managers who manage $5 million+ often have 10% alternative investing allocations recommendations (I was just at a JP Morgan Chase Private Wealth meeting doing some research). I think the alternative asset allocation is structurally lower than it could be due to access being still quite limited to the majority of Americans. 5) Maybe the mass affluent are much more diversified than the average person. The median household has a large majority of their net worth in their primary residence – a scary proposition when the housing market crashed. The PC data only reflects linked investable assets. Not everybody links all their assets like real estate, coin collection, etc like I do. In other words, the overall net worth pie is likely much bigger with different slices and slice sizes. My investments in stocks and bonds make up roughly 35% of my overall net worth, if I don’t count my online business. If I count my online business, stocks and bonds would make up less than 20% of my net worth. I’ve got 35-40% of my net worth in property and 10% of my net worth in risk free CDs. If the market takes a dump, I will still suffer on paper due to my real estate investments, but my cash flow will stay sticky because rents, CD interest income, dividend income, and online income are relatively sticky. Furthermore, I strongly believe in my ability to hustle and make more money if necessary because I’ve made money from nothing before. Overconfidence in one’s ability to make money may be the key reason why every single mass affluent demographic above is under allocated in bonds. I’m sure I’m being overconfident right now. Just like stocks, there are plenty of different types of bonds to buy. I personally just buy bond ETFs like I bought MUB, the iShares National AMT-Free Muni Bond in my after tax brokerage account. I view bonds, cash, and some commodities as defensive positions in a portfolio. Below are some other popular bond ETFs. From a top down point of view, I understand why investors are shunning bonds for equities. If you can earn a 2.5% or greater dividend yield in a decently valued company that also has the potential for capital appreciation, why buy a 2.5% bond that only pays you back the principal if held to maturity? Interest rates are close to all time lows and there’s this underlying fear that interest rates will rise and bond prices will collapse when the Federal Reserve finally starts doing away with quantitative easing. But bond investors aren’t stupid, and the bond market isn’t inefficient. Much of the interest rate expectations are already baked in. In fact, a strong government bond market (~2% on the 10-year), and collapsing crude oil prices could very well signal that economic weakness might be on the horizon, or that stocks are overvalued. If you’re over 45 and have been enjoying a fantastic equity run by being heavily overweight equities, I suggest rebalancing your portfolio to be more in-line with the New Life or Financial Samurai Asset Allocation model. We’re six years into a recovery and we all feel like investment geniuses. Even if you have a Survival Asset Allocation Model of a 50/50 split, you’ll still probably make a high single digit return if the bull market continues. The Personal Capital data is very telling about mass affluent investor sentiment given the 165,000 samples. As the company grows, there will be further insightful data points to share. The key is making an educated guess as to what all the data means. That’s where you make or save a lot of money. Updated for 2019 and beyond. The 10-year bond yield is over 3% now and buying bonds and buying short-term CDs is becoming more attractive. I dunno about the “surely.” That leftover $560,000 would last 5.8 years in Minnesota if one had to move to a nursing home permanently. The average annual cost of such a facility is $96,021. Oops…I meant to say the nursing home annual bill was a median, not an average. The figure is from a survey report published yesterday by a long-term care insurer, Genworth Financial. You know, bonds and bond funds/ETFs are very different animals in some ways. Individual bonds are an absolute promise to pay a set amount at a set time. If you sell them before then, their value will vary. But if you hold on to them to maturity, they have a set value. Bond funds values vary daily as interest rates change, even without selling them. I’m not saying one is better or worse, but they are different. I recently realized that with a pretty fat pension coming into the household, it’s pointlessly constraining to invest in bonds at all. Dividend stocks, value stocks, rental income…. A “fat pension” is like winning the lottery! CONGRATS! I am not overly bullish on the stock market, but I still allocate a relatively large portion to stocks as I feel that they are more likely to outperform in the long run. My main goal is to provide some diversity to my portfolio so that–hopefully–there will be one portion that won’t get hit as hard if stocks take a nose dive or underperform. I have about 75% stocks (U.S., developed, and emerging), 15% bonds, and 10% REITs. I separate out REITs because I believe they have some diversification value. I feel relatively confident that these will show a positive real return–even if low single digits–over the next 15 to 40 years. Other sectors/investments I’ve seen people overweight for diversification purposes are precious metals, energy funds, utilities, commodities, and hedge funds/mock-hedge funds. I haven’t decided to use any of these yet because I am not necessarily convinced of their long-term performance potential. Although, I am currently evaluating the possible inclusion of Energy Funds and Utilities. If I decide to included these in my portfolio, it would be at around the 5% level for each. I don’t have any bond holdings save what I have in a balanced fund that is about 15% of my portfolio. At some level I think i should have a bit more (I have only about 5% in my entire portfolio) but I come back to the idea that I don’t mind volatility and that I prefer growth and I just don’t get that with bonds. I can’t stand to see my portfolio not grow and under perform the broader indices. Maybe when I need the cash or income I will go to a lot more bonds, but I don’t see increasing that percentage for a at least a few years. Very interesting post, Sam. I don’t find the stats to be particularly surprising. Either the high stock allocation promoted wealth, or wealth (in the form of good income and job security) promoted the heavy investment in stocks. I admit, I am one of those people who is (almost) entirely in stocks. I do not count cash as part of the investment portfolio since it is for emergency uses only (and for peace of mind). I would like to diversify more but I am still in the asset accumulation phase. By “average” standards I’m doing ok. But by personal finance blogger standards, my net worth is still a baby. The reason I am basically 100% in stocks is because hubby and I are nowhere near retirement and are willing to risk the money we don’t plan to use. (Yes, I stayed invested during the most recent bear market.) Furthermore, luckily we are both of technical background and believe we may be able to freelance or find another job should the worst happen. I am so incredibly interested in generating a sustainable side hustle, you have no idea. The corporate world has some brutal hours. I want us to be financially independent like yesterday. Reformed Broker just did a solid post of the surprisingly strong performance of the old school 60/40 portfolio. Over the past decade it came ahead of the broader US market in return while having less volatility. Thought it was an interesting data point. I’m not putting the link because I think that’s throwing me in the spam filter (pretty sure my comment on the hedgefund article is sitting in filter somewhere) but I’ve quoted below. You mention that weak oil prices are possibly a sign of trouble to come and I’d like to offer a different perspective. The weak oil prices is actually a consequence of very good economics in the US and the shale boom. This has actually propelled the country’s domestic production to its highest level in 30 years and in 2014, the US produced 89% of the energy it consumed. Consequence : excess capacity on the world market, the US gains market share, OPEC loses market share and the cartel led by Saudi Arabia decides to keep production high to maintain prices low in the hope to weaken the US fracking industry. This is more about geopolitics than a weak global economy (even if it plays a part). In 6-12 months this is expected to be over and the US will go back to increasing its production. The latest EIA forecast sees oil prices remaining low (<80$) at least until 2020. So this should actually be a strong signal that the global economy will largely benefit from it. Bonds are currently overpriced! They are priced for global deflation. I would not buy them as an investment right now (I would consider them in a matching cash flow type situation). I think in this environment, blue-chip dividend paying firms are the way to go. I would recommend cash or cash equivalents as a replacement for your bond allocation. Also, many of the older generation may be collecting pensions (most certainly social security). Pensions are essentially a monthly bond payment, so I’m not sure having heavy equity exposure is bad. But, I would certainly recommend more cash equivalents as a risk management asset. 1. The Fed has stated, repeatedly, that interest rates will go up in 2015. Quantitative Easing ended last year (unlike what you state above), so rates are next. They need higher rates to have room to mitigate the next downturn, when (not if) it happens. Treasuries are so low they’re basically at the inflation rate (the government is so creditworthy it borrows for free) so the only way to keep going down would be to PAY bond issuers (negative real interest rates), or slide into deflation (see: Europe). If that happens, we have bigger problems. 2. Bonds provide diversification because they are (mostly) uncorrelated with stocks, not because they preserve principal. Bond FUNDS in particular shouldn’t be considered for preserving principal. The market price (NAV) of a fund is the value of the bonds it contains, so if rates go up (nowhere else to go), prices crash, and so does the NAV so there goes your principal. If you want to preserve principal (and diversify to uncorrelated assets) buy ACTUAL bonds that you can redeem at maturity (and take the lower interest while you wait and hope the issuer doesn’t recall the bond). I’m not sure if actual bonds appear on the PC dashboard (I don’t have any) but I know if PC manages your money they buy bond funds, not actual bonds. 3. Finally, a quick note about “alternatives” in PC — my adviser noted this includes REITs, commodities, and metals funds, so I think you might give us too much credit for holding “alternatives” when most people are just buying VNQ and GLD. These have different risks and are good for diversification too (less correlated to stocks and bonds) but they are not as esoteric as “alternative investing” vehicles like hedge funds and venture debt, which I doubt can be linked in PC. I’m lucky in a sense because my low-cost 401k target retirement funds put about 5-6% in REITs. I put a little more in VNQ in a Roth IRA so I get some fund diversification. I’m not convinced about GLD being a worthwhile long-term investment. I think it holds more value as a short to medium term hedge for those who investors who try to time the stock market. I think at a certain point one has to look at bonds as being a place to not lose principal. At a certain point with wealth one probably has enough, and just doesn’t want to lose it, the aggressive growth isn’t needed. That is absolutely correct. After one develops “enough” principal protection while beating inflation is what it’s all about. $200,000 is a great income per year, for example. Build a $6 million portfolio at 3.5% yield relatively risk free, and you are there forever. Is there really such a thing as having a portfolio that is yielding 3.5% “relatively risk free”? Bonds would be included in the portfolio so as not to lose principal but bond yields are so low right now, and any stocks giving you a 3.5% yield are not going to be low risk. So then how would a 3.5% yield be achieved with low risk? I grew up in the Peter Lynch era. Growth stocks and 10 baggers. In all my years of investing, I’ve only had a handful of 10 baggers, plus an almost equal number of worthless stocks. My father (and father-in-law) both invested in blue chip dividend paying companies. I’m retired and doing fine, but I believe I’d be doing even better if I learned from my dad and followed his example. At 65, I hold 5% bonds. Most of the rest are higher yielding (>3%) blue chip companies. I’m not concerned if the market drops as long as they don’t cut the dividend! No plans to ever touch the principle. Having a HANDFUL of 10 baggers is impressive! I’ve only had one, my unicorn, that has never been found again. A 95% equity weighting at 65 is impressive. May I ask what your weighting was between 2008-2010 and what investment choices you were making then? Never touching principal is one way of going for sure. It’s similar to never selling real estate and collecting rent. Sam, can you let this guy write a guest post? I thought I was your hero Steve? Jim, want to write a post? Let Steve and I know. Thanks. Some of the telecoms in the 90s, MCI for instance, simply imploded. Btwn 2009 and 2013, I was consolidating my 401ks and IRAs. Purchased bond funds w/dividend reinvestment for about 8% of my portfolio. Haven’t added or rebalanced. Growth in the equity side has lowered that 8% to 5%. All of them held PG, 7 held ABT, ADP, JNJ, MCD, PEP, WMT; etc. Steve, thanks for the kind words. What I’ve written above pretty much covers it. What an interesting post! I feel reassured, because I only have 4% in bonds, and I only have that because my vanguard advisor strongly encouraged me to out at least Some money into bonds. I guess I am not alone! I consider my rental property and p2p lending to be my “bonds” right now– fairly safe and they provide predictable income. One of my good friends comes from old money (meaning, they haven’t needed to work for income for generations), and I was discussing my investments with her – she was shocked I had any bonds at all! This was back in 2012 when I had ~40% in bonds due to my old advisor. She has always had all of her money 100% in stocks, most of them blue chip or dividend stocks. I started shifting things around after she told me that — if only we had talked in 2009 not 2012! Very insightful about your friend there! Nice job shifting more to equities in 2012. The question is, what now? Nobody knows. Rental property and P2P lending could be considered bonds, but property is illiquid, and as of yet, I’m not sure people can buy and sell their P2P portfolios in a liquid market place with reasonable spreads. At least bonds have the coupon component and principal gains and losses in the market. The title of this article is “Should I Buy Bonds? Wealthy People Don’t”. The Personal Capital data shows that for the most part wealthy people don’t buy bonds. Does the same personal capital data show that non wealthy people do buy bonds? Just curious. I’d like to know about the people below the 100k investable asset threshold. Doesn’t seem like you messed up if you’ve been able to accumulate 100K by age 22. Don’t think many 22 year olds can accumulate that much at your age. How did you do it? If you refuse to let people manage your money, and are conservative then develop a 50/50 equities/fixed income ETF portfolio that’s offensive/defensive. You can build one for $9.95 with Motif Investing for example, and the first trades are free. I did, and it was so easy. I currently have 0% in bonds and don’t plan on changing that any time soon. The interest rate has been kept artificially (and now historically low) for far too long. There is no doubt in my mind that interest rates WILL go up in the next couple of years – and as you know the price varies inversely with bonds. Getting stuck holding the bag doesn’t sound good to me! People have been saying interest rates will go up in the next couple of years for decades now. What makes you so sure? How long have you been investing? I like stocks over bonds in the long term. To me, loss of purchasing power is a bigger risk than market volatility. Just like @Gen Y Finance Guy and @Robin, my plan right now is to pay extra on the mortgage. If the stock market takes a dive before I pay off the house, I may reallocate some of what I was adding to the mortgage to buy more equities while they’re on sale. I wouldn’t be too afraid of the loss of purchasing power. I would be more afraid with the actual loss in principal. Aren’t we seeing a skewed perspective because real estate and equities have outperformed bonds substantially in the past 25 years? Hard to say. I would love to see the PC data from 25 years ago to compare snapshots. During bull markets, it makes sense that the skew is towards equity. Investors tend to lose their discipline, which is one reason why bubbles grow and burst. Very interesting stuff. We currently hold no bond in our portfolio, 100% in equity. In our son’s RESP we’re holding 15% bond as the timeline is somewhat shorter. At current interest rates, holding a large percent of bond may not make sense. Interesting stuff. That is kind of ironic that your son has a higher bond weighting than you given he’ll need to go to school soon, don’t you think? Just goes to show that asset allocation isn’t just an age thing, but a purpose thing. Very interesting post. Bonds are mostly compelling when there is a potential for arbitrage. They are a tool best made for financial engineering with large amounts of capital. Seems to me the time is right to either be hedged or mostly in cash. The markets really are flip flopping now with no direction. I ALWAYS love to be hedged in someway…. the range for me ranges from 10%-50%. But the other “hedge” is build those multiple income streams and also work ethic. Sam — Good post to make one think. But….which is it? b) Wealthy people do not follow the conventional asset allocation model for buying bonds (your first sentence premise). My vote is a very strong “B.” And this does not mean they are bond free. I also know a few people – admittedly not many – who once they made their $20 to $50 million, said “I’m done playing” and have gone mostly bonds with a big chunk of their dough and they simply live on the dividends. But I’d say that for most wealth ACQUIRERS, too much in bonds equals less than mediocrity. The “age in bonds” thing absolutely never made sense to me. It didn’t 20 years ago, and it REALLY doesn’t now. I’m at 20% bonds now and MAY get up to as high as 30% in the next 10-15 years. Even your FSAA Model is a bit too sleepy for me. Speaking of sleepy, look at the boring-assed Vanguard Wellington Fund. You could hold that fund, sleep under a nice and large oak tree while you’re not playing tennis, and do better, total returns wise, than most U.S. investors over lengthy periods of time. I’m seriously tempted, at some point in time, to dump EVERYTHING in there and never pick up a WSJ or read a financial blog again. zzzzzzzzzzzzz…….ahhhhhhhhhhhh………..
Yep, I’m not “bond free” because I rolled a retirement account over to Wellington. Boring…and consistent. As in consistent for decades. Actually, the average age for all PC users is something around 45-48, and older for those who are in the mass affluent crowd. I’m sure the majority of 50+ mass affluent haven’t heard of Personal Capital. It’s a simple numbers game. There are more than ~100,000 – 165,000, 50+ mass affluent people. Bonds are considered to be safe a investment however I see it as quite opposite as resulting opportunity cost. Not taking risk is the riskiest move of all time. As I am still young( I am early 30s), I will keep pushing for equities. Thanks for the excellent posting. I suspect many investors in today’s markets, especially the older ones, are desperately chasing returns due to central banks’ ZIRP or NIRP policies. When you haven’t been saving enough for retirement, the economy is tanking, and you earn nothing on your cash, you have to put your money somewhere, and bonds just don’t perform. Given the average investor’s overconfidence in their abilities, it ends up in stocks. The market correction when it comes will be devastating. I like the pessimism! It will be devastating, but people will learn after devastation and become better because of it. You’re right. Greed might be impossible to overcome for 95% of the world! To make your statement apply to me, I would only change one letter. Make the first “e” in “better” an “i”! Would you include P2P lending portfolios in your “bond” category? I’m 25 and have about 8% in P2P lending. I’m wondering if that breaks from your model of 0% bonds for my age range, or if you’d consider P2P lending an alternative. THIS!! Sam, any chance you can convince the PC guys to put Prosper/Lending Club assets in the proper allocation in PC? Right now they just put it in cash which doesn’t make sense. Good question on P2P lending. I would categorize P2P lending as a higher risk bond, whose risk declines the bigger your diversification of notes and the quality of your notes. P2P wasn’t something I really factored in when I first came up with my asset allocation model. But with even the most conservative P2P lending portfolio (min) returning 7.4%, it’s pretty healthy. Some would categorize P2P lending as an alternative investment. It’s more semantics at this point. What are you thoughts on how real estate should factor into a persons asset allocation? Rental properties can be a great source of income, although the housing market will often follow the stock market on the way down. The only good thing is when the housing market collapses, more people tend to rent as a result. It is all about adapting your pricing structure at that point. Thoughts on what percent you think that should make up in this modern era? Check out the post on New Worth Asset Allocation. In a very real way, real estate is like a riskier bond and I love real estate, partly b/c I love tangible assets. That data is a bit surprising to me. I can’t imagine have over 60% in stocks at age 75+. I have only stocks in my compan accounts because there are no low cost bond fund options, but have several bond funds in my rollover IRA. I don’t love bonds, but consider them to be a necessity against downturns in the market. My largest bond fund has actually returned a cumulative 23% over 3 years (including dividend reinvestments). I think I may need to reweight a bit after reading this, I am too heavy in equities! I must be the opposite of you as I can’t imaging ever allocating less than 60% to stocks. I’ve seen some valid arguments made for holding a large percentage of bonds. In the end, it’s up to the individual investor. No one can tell you your way is wrong. If the only criteria used to classify PC users as “mass affluent” or some other demographic is the dollar amount in linked investable accounts, the PC data miners miss the mark. Less than 20 percent of my net worth is in linked investment accounts. The remainder is in real estate. To determine the investment allocations of their users, PC should look at investment real estate and other assets that are not linkable. 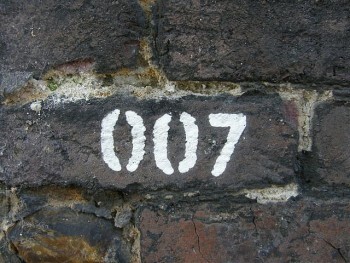 I think the data miners would find pensions in some cases and real estate in more cases have taken the place of bonds. An astute observation you have made here. The data is of investable assets, which may include REITs. The data doesn’t include assets like real estate. In other words, the pie is even bigger and more diverse. We are only looking at investable assets, which includes cash, CDs, investment portfolios, and I believe 401ks and IRAs. Therefore, bonds and cash as a percentage of TOTAL NET WORTH is likely even smaller given equity and fixed income investments aren’t usually 100% of one’s net worth. If you are questioning the definition of “mass affluent,” then the linked investable assets have already fulfilled the criteria of $100,000 – $2,000,000 in investable assets as we scrubbed the data down from ~800,000 to ~165,000. If you are arguing that the definition of mass affluent is people with investable assets MORE than $2 million, then you are correct, we don’t account for them as we drew the line at $2 million. Anybody who has over $2 million to invest is rich, in my mind b/c that $2 million is not all s/he has. Maybe PC has changed since the original post over two years ago, but my real estate assets are included in the Net Worth section of my PC dashboard. Or maybe just the data set used for the analysis didn’t include that? Today, PC uses Zillow estimates to value my primary residence as well as my rentals. It also allows me to manually enter other assets like some producing agricultural land I own. Everything you learned in college about capital allocation by age is tailored to “normal” people. Normal people are risk averse and cannot understand why you would buy stocks. However your information is the reality. If you have 10 years of living expenses sitting in cash… Why would you *ever* own bonds? It is a waste. Plug in the inflation calculator what happens to a 4-5% bond over 20 years. Your purchasing power goes up by an embarassing amount. May as well be flat. 4) also tend to own real estate. “If bonds only appreciate by 1% a year but stocks appreciate by 5% a year over the *long-term*” which one is the riskier asset? Bonds. Yep. Bonds are not a “safe” investment. In fact, they are a very risky investment and the risk is inherently mispriced because of the emphasis on the reliability of the income and the stability of the borrower. Real estate, equities, and cash are my biggest holdings. Cash pays ongoing expenses and is held to buy quality assets on sale. Another great article Sam, thank you for examining more complex financial issues. This was particularly timely because I’ve been looking to increase the bond exposure in my portfolio. I’m 33 years old and currently sitting at about 8% bonds when considering solely my stocks and bonds. (I’m not exactly sure of the percentage of my overall net worth since I have most of my net worth in real estate equity for both my primary residence and rental property as well as larger cash reserve due to the rental. I’m also looking to purchase my second single family rental property in the next year.) Without trying to, it looks like I’m close to using your recommended allocation. Would my best bet be to increase my bond purchasing to hit the 80/20 mix around 35? I think an 80/20 mix is a reasonable allocation for 35, it all depends on your risk tolerance, cash flow, retirement goals, etc though. With rental property in your NW, it’s kind of like having bonds already as they have some similar traits. What is your real estate weighting as percent of your NW? I’ve never thought about my real estate investment acting like bonds to buoy my net worth, but you’re right: it’ll hold some of the volatility away. I wanted to purchase a second investment property and was debating refinancing some of the equity out of my primary residence for my downpayment, but I’m not sure I’m willing to get that risky. I find your data very interesting and I’m looking forward to more insight as it becomes available. I think about 50% of Americans have too much confidence in the stock market (and thus are over-allocated), 50% are too distrusting of the stock market (and thus are under-allocated) and about 99% of Americans suffer from their misunderstanding. Having said that, how will bonds perform going forward and who should invest in them? I used to have 25% of my portfolio in bonds, but this has been reduced to less than 5% (keep in mind – I’m 29 years old). It’s impossible to know where bonds are headed for sure, but I would say “not as good as the last 30 years” and “not as bad as people think.” Yes, interest rates will likely rise at some point, but when and by how much is a guessing game. Most people thought that it would’ve happened last year, but they didn’t foresee international calamity (and the influx of foreign money coming to the US). If I had to predict my future asset allocation, I would think it would look very similar to your chart. Sam, I meant to ask you about your thoughts on investing in long term treasuries and TIPS? Treasuries for deflation and TIPS for inflation. Am I simplifying too much by thinking the risks would offset one another (leading to protection in any environment) or is there a way for each to “get slaughtered” simultaneously? It all depends on your outlook on inflation, which I’m of the belief that there is very little inflationary pressure for most of the country. As a result, TIPs will underperform nominal bonds. You can’t get slaughtered if you have a balanced asset allocation. Everything is Yin Yang. If inflationary expectations increase, that means the demand for money and/or employment/wages/corporate earnings are increasing. That’s good for asset holders and employees. TIPs allow you to just lose less in principal. With normal (or nominal) fixed-income investments, investors bear inflation risk in that the purchasing power of interest payments could be eroded by inflation over and above their original expectations. TIPS, however, are guaranteed to keep pace with inflation as defined by the Consumer Price Index (CPI). This is what makes them unique and defines their behavior. To illustrate, assume a $1,000-U.S. TIPS was purchased with a 3% coupon; also assume inflation during the first year was 10%. If this were the case, the face value of the TIPS would adjust upward by 10%, to $1,100. Furthermore, the coupon payment (3%), which is also based on face value, would be $33 (payments adjust and are paid semi-annually). The end result is that not only are interest payments protected against inflation, but so is the bond’s face value, which is returned to the investor at maturity. Traditional nominal bonds offer neither of these protections. Because TIPS protect investors against inflationary concerns and nominal bonds do not, they behave differently from one another. More specifically, as inflationary expectations increase, nominal bonds will become less attractive as future interest payments are eroded by inflation. Similarly, as inflationary concerns decrease (which includes deflation), nominal bonds become more attractive relative to TIPS as future interest payments become more valuable on a real (or after inflation) basis. People are over allocated as is the usual it seems with long bull runs. If you graph the household allocation to equities % at FRED its currently at all time levels consistent with 1929, 2000, and 2007 (good company). It also does have an increased bias due to the very low rate of return, thus maybe making people feel compelled to equities. What else are they going to do? Seems to be the thinking. I myself am 100% in equities, though just starting out and mostly in blue chips with strong dividends bought at good valuations. I do have about a 3rd in an s/p index, that I am tempted to move into a bond ladder/cash mix of some kind in the future to avoid a total dump, and provide some liquidity when the market corrects so I can buy back in at better valuations again. Bonds are not excellent wealth accumulators (though some have done it), but they are a place to park money and not lose a bunch. At some point preservation must kick in, preferably before 89 years old. While we may be 6 minutes to 3 years until the next correction/crash, it will eventually happen. Part of making your money work for you is to lose as little of it as possible. Thats the point of bonds, even when younger. You dont have to have a static allocation, but becoming more defensive as the market gets greedier isnt bad advice. I am personally bearish both bonds and equities. 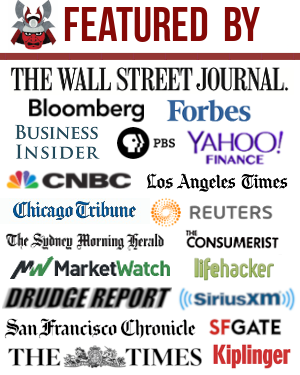 We have had a fantastic run in the stock market these past 6 years. 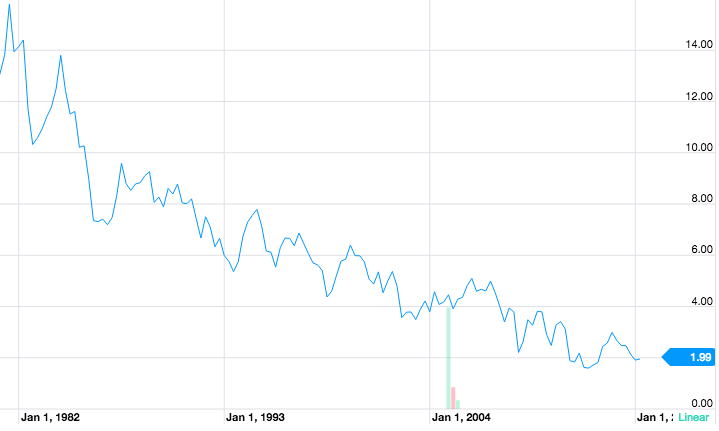 And as you mentioned bonds have continued a 30 year decline. There is a scenario where interest rates stay low for an extended period like Japan (over 2 decades and counting). I also realize that because the US seems to be the best of the worst when you look at the economies around the world, that bonds may hold their own as our bonds seem to be the safest bet. But I have a hard time thinking that interest rates are going to go much lower than they are currently. The risk/reward in bonds to me favors the downside. With the 30 year government bond yielding like 2.5%, I would much rather pay off my mortgage sooner than tie up my money into bonds. My rate on my mortgage is 3.675%, and in my opinion the interest saved by paying of my mortgage early is the same as interest earned. And the tax savings is pretty negligible over the 7-year period I plan to pay it off. At a 38% tax bracket I lose something like $11,000 in tax savings, but save $28,000 in interest over the same period….then of course there is the interest savings over the 23-years I will not be paying a mortgage. So in lieu of bonds I will continue to allocate a % of capital to pay down the mortgage at an accelerated pace. I’m with you, Gen Y Finance Guy! Although I’m a Gen-Xer, I’d rather pay my mortgage off more rapidly than invest in bonds. Having our primary residence paid off grants a peace of mind that (for me) is invaluable. Its hard to put a price on piece of mind. I couldn’t agree more, I would rather first pay off my mortgage too. And even then, I would rather invest my money in many other places before bonds. Like buying more real estate, or another business. I have no bonds, but I do have private promissory notes. I expect to do more private loans backed by real estate as I get older. In a sense, my own high yield bonds. i would never buy bonds. I only hold cash as margin requirement for short options. in my opinion there is no reason to diversify in bonds. To build wealth you need all your money put to work. Bonds are a place to park money only, they are not an investment. Why do you say bonds don’t put your money to work? To also build wealth, you need to not lose your money. Bonds can hold onto their value in a way that equities cannot. I don’t know what the right answer is, and I’m not sure the conventional wisdom of ever increasing bond allocations as you get older is the best. But I’m reluctant to dismiss the value of a financial product that has been tested through time. The fact that bonds have existed for so long should indicate to us that there is value in owning them. You got already the point. Bonds hold the value of your money, but they are not there to create wealth. For every goal there is a tool and bond is a tool to preserve wealth, but stocks are the tool to create wealth. There is some truth to that statement, but I think it is incomplete. But while cash (to use a different asset) may not directly create wealth, it can be used to buy equities or other deflated assets in a market downturn. So in essence it can be used to create wealth because it is there when buying opportunities present itself. Same principle applies. I’m not trying to advocate bonds, but if you are all in in equities because that is how you build wealth, you are taking on a lot of risk. It is hard to build wealth if a deflationary cycle cuts it in half. I totally agree with you, but I think we also have to consider the opportunity cost of holding cash. If equities, on average, build wealth, then by not holding equities, a person is essentially refusing to make the logical investment decision of holding those assets. The big x-factors are an investor’s time horizon and discipline. Most of us here are probably hoping in some fashion to retire early, or become financially independent, which significantly cuts down on our time horizons. That’s the primary reason I see to hold bonds–they give you safety in a shorter time horizon by providing consistent income (albeit, likely lower overall returns than equities over time). If you happen to not need that income, then you’re probably going to lose out on some overall returns that you could have made in equities. But if you do need that income, you’re winning because you don’t have to sell your equities at a depressed price. People talk about having to sell stocks to raise cash in a down market, wouldn’t that also apply to having to sell bonds at a depressed price to raise cash when interest rates rise? Definitely. And I have considerably more in dividend stocks than bonds, but I like bonds as well for a few of the reasons that you mention. First, the tax benefits on muni bonds (I wouldn’t really hold regular bonds in a taxable account). Muni ETFs right now yield about 2%, which is the same as the S&P 500 dividend yield, but are not taxed. And probably most importantly is the negative correlation between stock prices. I expect my dividend stocks to move in tandem with the overall equity market, even if the drop might not be quite as drastic (in 2008 we saw strong dividend stocks retaining slightly more of their value in the market). Bonds should not be so correlated. Also, a company can cut dividends during tough times, while a fixed-income investment will stay consistent (assuming the creditworthiness of the obligor). For my mom in her retirement years her tax exempt muni bond funds provide an income stream of 3% that is tax free. It’s only 30% of her portfolio however. I for one am glad she has them. For her it’s all about income vs. growth. But her Blue Chip stocks have grown nicely for her while also providing dividend income.